Top Swedish politicians have introduced an official memorial day for the "great Swede" Raoul Wallenberg, who saved 100,000 people from the Holocaust in Budapest during World War II. In an opinion article published on Friday in the Dagens Nyheter (DN) newspaper, Wallenberg's sister Nina Lagergren, Culture Minister Lena Adelsohn Liljeroth, and United Nation's Deputy Secretary-General Jan Eliasson lead the call for a new memorial day on August 27th to honour the famed Swedish diplomat. "It is time to manifest the individual's responsibility to tackle oppression and xenophobia, and to underscore Sweden's traditions of openness and tolerance," they wrote. "Far too many people avert their eyes when someone finds themselves in trouble or are being threatened. Far too many decide not to react when they see bullying and injustices." "Courage is tested in small ways in everyday life." The declaration of a memorial day comes after the conclusion of a year marking what would have been Wallenberg's 100th birthday. It was filled with events to honour and celebrate his legacy. "It's important that the wide range of activities surrounding Raoul Wallengberg during 2012 don't end in silence," they wrote. Siavosh Derakhti, founder of Young Muslims against anti-Semitism (Unga muslimer mot antisemitism), the head of the National Education Agency (Skolverket) Anna Ekström, and Eskil Franck, chief curator at Swedish museum The Living History Forum (Forum för levande historia), were also on the list of co-signatories. "It is deeply symbolic that Raoul Wallenberg sacrificed his life in fighting one of the 1900s evil ideologies, Nazism, and fell prey to Stalin's Communism," they wrote. 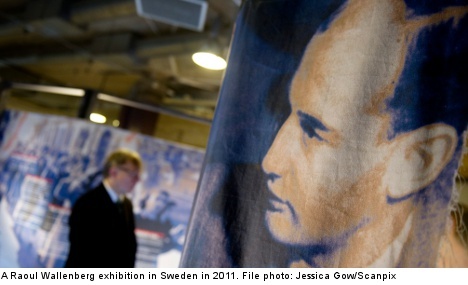 The authors said that a recent review showed that school history books rarely mention Wallenberg. They said perhaps the silence was due to 'Swedish shame' at not investigating his disappearance in the Soviet Union more thoroughly. They also noted that he was more famous abroad, where Canada, Argentina and several US states already had Raoul Wallenberg memorial days. "What he stood for is not just about history. It is, unfortunately, relevant today. Anti-Semitism is not a painful historical experience, but a reality that lives on," they wrote. "History may not repeat itself in exactly the same way, but the echoes of history permeate our era. The internet is overflowing with Holocaust deniers and attempts to link every ill deed, from 9/11 to Utöya, to a Jewish conspiracy." "These conspiracy theories about Jewish power and hidden motives are classic elements of anti-Semitism." They linked the need to fight anti-Semitism to rising xenophobia of all hues that had worsened due to the financial crisis. They called anti-Islam rhetoric a relative of anti-Semitism and asked people to step up against intolerance. The authors note that there is no official process for introducing a memorial day in Sweden, but that the chosen date is meant to coincide with the start of the school year and will make it easy for educators to plan activities to boost awareness of Wallenberg's legacy among Swedish schoolchildren.